Make an informed purchasing decision by knowing what stands out in all three styles. Among the most popular shutter styles today are board, batten, and louvered. If you’ve never considered the differences between the three, you’ve got a job ahead of you. Rather than waste valuable time researching shutter styles on your own, we’ve taken care of the task for you. You’ll have no problem getting down to business, buying, and installing the type that works best for your home. Here, we’ll discuss three shutter options that many people want for their homes as well as what makes them unique, preferable, and the perfect addition to your property. Board shutters are distinct in appearance. After all, they’re just a combination of two or three boards joined together and hinged to create protection outdoors for windows. They’re appealing because they come in a variety of wood styles and can be stained or painted to match a home. Available in a variety of sizes to meet your needs, you’ll want to consider how this style of shutter looks on your home. It’s the type of option that is relatively easy to install and enhances the curb appeal of a property. Details like this help bring up the value of your home and make it more attractive to buyers should you decide to sell it at a later date. Batten shutters aren’t much different than board shutters. They may, however, have more rounded design at the top to fit different shapes of windows. Very durable, this style of shutter is all about protection. Think of the word ‘batten’ and the context in which it is used. Securing a home during hurricane season is easy with batten shutters. They provide peace of mind by allowing you to ‘batten down the homefront,’ keeping fragile glass from shattering at the slightest hint of high winds. Part of the appeal of louvered shutters is how well they complement certain styles of home. Extremely versatile in that regard, they can be left unstained for a more natural look or painted a contrasting or complementary color to make windowed areas of the home stand out. Louvered shutters are instantly recognizable. They consist of frames of various heights with overlapping slats of wood, metal or plastic depending on the material of choice. Each type adds to the ambiance of the exterior of a home as well as serving as protection for fragile glass that may be exposed to high winds, hard rainfall, and hail. 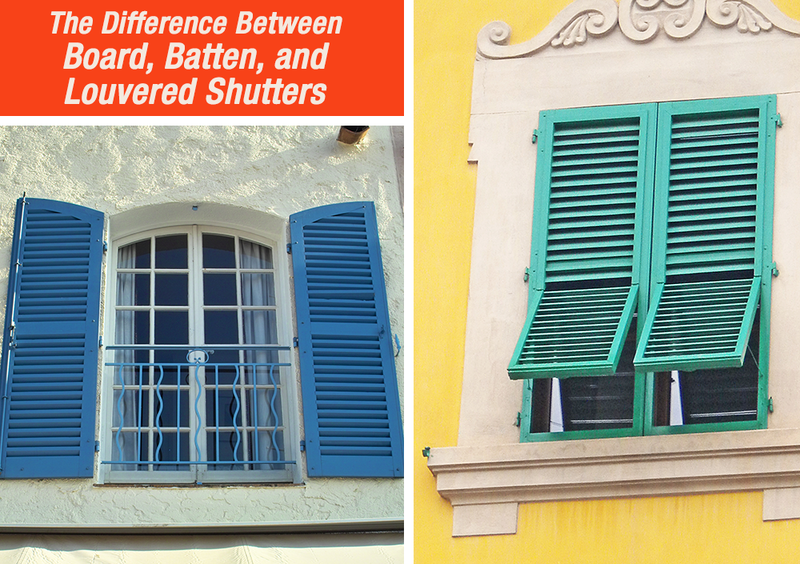 Now that you know the difference between all three shutter types, you’re able to make an informed decision about which to include on your windows. You understand how each looks and what makes them the ideal choice for your property. When in doubt, don’t hesitate to contact Palm Coast Shutters for more information. We offer painting and repair services, too, in the event your shutters need extra care and attention. Let us know how we can assist you by making your home more attractive and hurricane-ready going forward. Your satisfaction is our top priority.